Humor, adventure, hope and courage combine in this memorable tale of loss and discovery. Contrary to what you’ve always heard, a dog's life is never simple. To his dismay, the life of an insecure pup, too young yet to have earned a name, changes overnight in this tale about six former pets who meet and bond inside a rehabilitative hospital for animals. 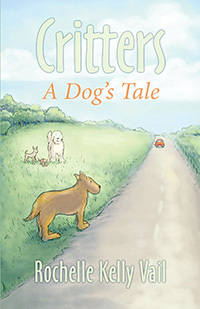 Just what happened to his family is the biggest mystery our main character, known as "Dog," must figure out in this fast-paced adventure that takes the animals on the road and into surprising and sometimes harrowing situations in which their instincts might be the only thing they can trust. The critters: a stuttering ferret, yappy small dog, blind cat, shy gerbil, and tough old canine who follow Dog everywhere seem determined to find in him what he cannot see in himself. And when one of their members is stolen away and the pack plots his rescue, Dog is tested in a way he could have never imagined. “Uprights must surely live there!” I tell the critters about the house I saw in the woods. The ferret, as usual, is the lone voice. “I I I I don’t think this is is is is such a good idea,” he says. But no one listens. They trot toward the edge of the forest, waiting for my lead, and I comply. Tearing with my teeth at the tall and prickly brush, stomping down with my front paws (when did they grow so large?! ), I try carving out a clean path for the others to follow. But cat doesn’t wait. Taking over the lead, she slinks silently under low hanging branches, like those critters that slither along the dirt until they’re right under your feet, ready to strike. Stepping long and low into her tiny footsteps, we hardly make a sound, and I wonder if this is what it’s like to be a snake. “Ca ca ca ca cat!” screams the ferret. “Shooooooosh,” scold the others. “Aaaahemmm,” he darts back. “Is s s s isn’t this how ca ca ca cats stalk mice? !” he bellows toward the direction of the gerbil, who waddles beside me. “I can still taste their salty skin,” The feline says to no one in particular, licking her whiskered lips. I throw back my head to quiet the foolish ferret that clings to my neck. “Hey! Wa wa wa what’s the big idea?” Cat throws a sidelong glance at the shaking gerbil who stops in her tracks and huddles to the ground, shaking so violently, I think her hair might fall right off, likes leaves blown clean off a tree during a storm. Lowering my head now, as the ferret falls toward my brows, I lick the back of the gerbil and ask if she’d like a ride. “Pfffft!” She looks up at the ferret who sounds his annoyance, then looks back at me. “No thank you.” The gerbil plods alongside me – one eye forward, the other on cat. We come to the edge of the thorny dark forest and step out onto dusty brown covering. I swing my head from side to side, growling low until all eyes are on me and the pack stops in its tracks. I’m still not sure why they look to me for direction, ask me to lead, follow me anywhere. “Why why why why’d we stop, dog? !” The ferret yells into my ear. I shake violently to release the piercing pain and he swings off my back, tumbling to the ground like dust balls on a hot day. “Heeeeeeeeee,” the pack snickers. “Grrrrrrrrr,” I sound again, deeper and louder. The big dog trots gently to the front, making “plop plop plop” sounds as his large feet touch down. He stops in front of me, shifting in the air. His big ears stand tall and I know he hears it too. A shiver runs the length of my spine as I feel my tail swing back and forth. “What do ya want to do bout it?” he asks in a low, calm voice that hangs in the air. Do? Why do I have to do anything? I search his eyes for the answer. They offer none. We hold each other’s gaze for a while, and then his eyes drop to my feet. I look down too, thinking the answer is down there. Finally, he speaks. “You know we need a home, but.” He stops. “Something bad has happened here.” I need to lie down. My head is thick and my stomach burns. I walk in a circle to nowhere in particular and sit down. I feel my eyes closing, but something stirs me awake. I open them to find the pack staring at me, eight pairs of eyes searching for the answer. And they think I have it. “We must not. We cannot.” A noise, like a tummy gurgle, escapes my throat. “We have to keep going.” “Whaaaaat?” It is the ferret that launches first. Then little dog. “But my pads are so tired!” he moans. And the gerbil. “I don’t think I can,” she says. I look at big dog who watches us intently. He turns his head quickly and walks in a circle for a moment or two before settling into a comfortable circle on the dusty ground. I stare at the back of his head willing it to turn around and face them and their questions. But the big, bulky head doesn’t leave the edge of his paws. Rochelle Kelly Vail, a California native, lives in the San Francisco Bay Area with her husband, two dogs and two cats.